Classes for this term ended yesterday, and I have a few immediate thoughts/reflections after the term has finished, about my Introduction to Philosophy course that I wanted to write down so I don’t forget them when I’m planning for the next time! Here are a few things I struggled with determining how to do best this term. This class meets Mondays and Wednesdays for 50 minutes in a big group, and then students also attend one more 50-minute discussion group run by a Teaching Assistant. I run the M,W classes, and it’s often a struggle for me to figure out how best to balance lecture vs. active learning time in that class. On one hand, there is a great deal of research literature showing that students learn better if they don’t only listen to lectures but also do something with what they’re learning. On the other hand, I do think lectures can be quite useful if done well (and I try my best! ); plus, students need to have some kind of basic understanding before active learning on the material can be effective. This can be gotten through what they do outside of class, but just reading philosophy texts on one’s own, if one is new to philosophy, isn’t usually the best way to get that understanding. I have created a few videos to help students with some of the readings but these are time consuming to make and I haven’t made very many. In addition, since students also attend a full discussion group meeting once a week, I feel like I don’t want to do too much in the way of activities in the M,W class because I need to leave some of that available for the other class. I did a midterm survey to get feedback partway through the course, and most students seemed to think the balance of what we were doing in class was fine; some wanted a little more lecture, some wanted a little less, and there wasn’t a strong majority on one side or the other. Still, I feel like I want to work on this more, partly because of the next thing. One student on the midterm feedback survey made an important point: they said that they felt like the people who did the readings before class (which I ask students to do!) got punished, in a way, because the lectures often went back over the readings. I agree! I struggle with this too. The issue with intro to philosophy courses is that philosophy texts are not always easy to read and understand, for those new to the field (and also sometimes even for those familiar with the field!). As a result, all of my experience as a student, a grad student TA, and visiting others’ philosophy courses at times, shows that we tend to ask students to do the reading before class and then we go back over the reading in class to clarify the arguments. It is of course critical for all of us to have the basics of the arguments before writing essays about the philosophical views. But I think I can work on this further by having more guidance for students while they’re reading or just before class. So, videos to help break down the basics, or formative (non-graded) quizzes to help them get the basics before coming to class, e.g. This is not something that can be done quickly but I can build it up over time. I also want to take more time in class to talk about how to take notes on philosophical texts, and find ways to encourage more note-taking while reading. One way would be to ask them to submit notes from time to time that are graded just for completion. I made that an optional way to earn participation marks this term and those who did it did a great job! The only thing that has kept me from making this required is the large number of students in this course (usually between 100 & 150), and the difficulty of keeping up with marking. But I’m going to give this some more serious thought. Then we could do other things in class, like delve more deeply into potential criticisms of the arguments–if they have the basics first then we can go deeper in class. Last year I asked students to submit their completed first essays for peer feedback: after they submitted their first essays, they shared with one other person who read the whole essay and gave feedback for the purpose of improving the writing for the second essay. On the student evaluations some students wanted to be able to use peer feedback before they submit the essay for a mark. So I changed things this year and had students submit something for peer feedback before each essay. For the first essay they submitted a draft introduction paragraph with a thesis statement, plus topic sentences for each body paragraph. That was due a bit over a week before the essay, and then students got comments from two other students (ideally) before finalizing their essays. For the second essay we did something similar, though this time they could submit up to 350 words of a paragraph about one of the philosophers’ views, if they wanted, or the same kind of thing they submitted for the first essay. The purpose of the paragraph option was to get feedback on whether they got the philosophers’ views correct and on the balance between quotes and paraphrases in the paragraph. We did the peer feedback online (on Canvas), and it worked mostly okay. The main concerns I had were that some people submitted work but didn’t give any feedback on others’ work. The system automatically assigns two other students’ work for each student who submitted something. So for the surprisingly significant number of people who didn’t do any peer feedback, those other students missed out on comments (the TAs and I offered to talk to students who didn’t get any feedback from any other students, to discuss their work–which is of course something any student could also do!). If the latter, probably the option to rewrite the essay should be made available. Last year we did peer feedback in person–students could only participate if they came to class and exchanged their essay with someone else. This meant that students actually did it, but it also meant it couldn’t be anonymous. There are pros and cons for each! Those are my initial thoughts here at the end of the term. I will do more reflecting after the student evaluations of teaching results are out! Posted in In the classroom, Lectures & discussion, Reflections on my own teaching, Teaching and tagged Introduction to Philosophy, PHIL 102 on April 7, 2018 by Christina Hendricks. 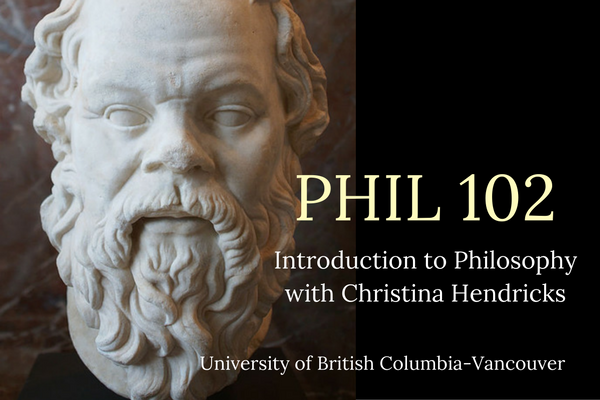 I’m teaching PHIL 102, Introduction to Philosophy, Jan-April 2018. I have taught this course many times before (and have blogged about it; see here for posts about the course), and I keep revisiting it and renewing it because I’m never fully satisfied. This year I’m focusing my changes in large part on the question of how best to use class time. See the previous post for some general reflections on that. Below are some problems I am seeing in PHIL 102 that lead me to wonder about my use of class time and whether I should change it. Posted in In the classroom, Lectures & discussion, Reflections on my own teaching, Teaching and tagged PHIL 102, use of class time on September 20, 2017 by Christina Hendricks. 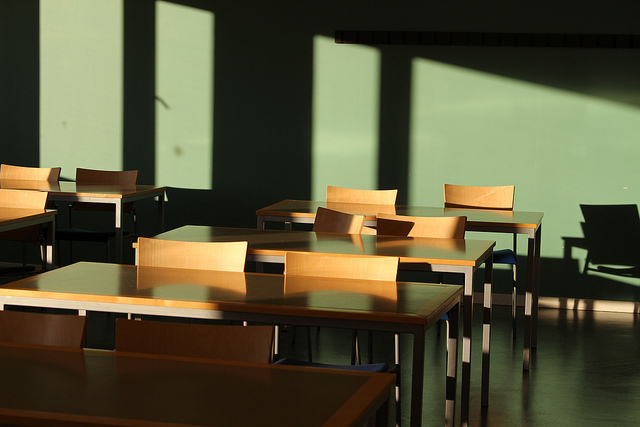 Classroom by Victor Björkund, licensed CC BY 2.0 on Flickr. Eleven years ago, during the summer I first started this blog (2006), I wrote a couple of posts about the use of class time: What is class time for? Part 1 and Part 2. I don’t know whether the fact that I’m still dealing with a version of the same question this many years later means I’m just failing or that it’s a hard problem. I believe the latter, though! In those posts I wondered what is the best use of the limited time that we have to have students together in a room (if we teach face-to-face courses, that is). What I was used to from my own courses, and what I did when I first started teaching, was to use that time to: (1) do a lecture in which I explain the assigned readings, clarifying complicated points, heading off potential misunderstandings, and then also either offering a critique or inviting students to offer critiques; and also (2) often I would find ways to engage students in a discussion of some philosophical question. This latter would be either the whole class together (depending on the size of the class), or small groups. Why should students spend time reading (let’s face it, often difficult) texts when they can come to class and get it explained by the prof? My conception of philosophy, especially for students who may take one or two philosophy classes but won’t be majors, is that it could go beyond reading writings by others and discussing them. I think philosophy is valuable and useful beyond the academy, and doing courses in which all students do is read what others have said and critique it can give a narrow view of what philosophy and philosophical activity are and could be. That’s what professional philosophers do, but most students in my 100 level courses won’t become professional philosophers. Does it really help students learn how to understand and critique complicated arguments if the instructor usually does it for them? Some modeling is necessary, of course, but more practice than I used to give (and frankly, more than I currently give) could be pedagogically useful. Now, here I am in 2017, still addressing a variant of the same question: what is the best use of that limited face-to-face time? What do we need to be in the same room together to do, and what can be done without being in the same room together? (The success of many online courses says there may be a great deal that can be done separately, asynchronously, online). Posted in In the classroom, Lectures & discussion, Reflections on my own teaching, Teaching and tagged use of class time on September 20, 2017 by Christina Hendricks. Image from front page of my PHIL 102 course site from Spring 2017. 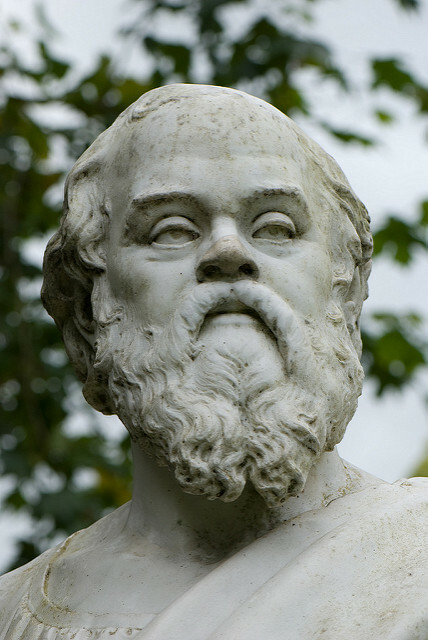 Image of Socrates is Bust of Socrates from the Louvre, by CherryX, licensed CC BY-SA 3.0 on Wikimedia Commons. I am working on my Introduction to Philosophy course (PHIL 102) again; I’m teaching it next starting in January 2018. But I’ve just been appointed as the Deputy Academic Director of the Centre for Teaching, Learning and Technology at UBC (starting July 1, 2017) and so I’m trying to get as much planning done on this course before the Fall as I can). I have taught this course many times already and every year I am not fully happy with it and try to make it better. This year was no exception (I taught it from Jan-April 2017). Some of my previous blog posts about this course are here. The post I did in Summer of 2016 on this course I thought was pretty good on overall learning goal planning and reflection, so I’m going to reuse those ideas. But this post here will be a bit different; I’m going to approach it from the perspective of what I thought didn’t work so well, and see if I can’t come up with new ideas from there. Posted in course design, In the classroom, Lectures & discussion, Reflections on my own teaching, Teaching and tagged PHIL 102, use of class time on June 6, 2017 by Christina Hendricks. I asked for feedback on how things are going in my Introduction to Philosophy course, right after Reading Week (which was at the halfway point). Here are some of the common answers, and my replies! This post was originally posted on my Intro to Philosophy course site, where I put it for the students to read. I’m re-posting here on my blog. There were a number of people who made comments regarding the balance of lecture and discussion in the M,W classes. The majority of students who gave feedback like having discussions in class as well as lecture (twice as many as those who said they want more lecture). One said they wanted more discussion and less lecture. Some said they appreciated combining ideas on Google docs because that way those who don’t want to speak in front of the whole class can still contribute. That is exactly what I use these for! And don’t forget that you can see them all under “notes” on the main menu, above (notes from in-class discussions). These, plus the discussions in the discussion groups on W, F, plus the discussion summaries are things you can use when thinking about your essays–they provide interesting views on the readings! A couple of people wanted less discussion during the M,W classes and more lecture. One thought that this was a distraction from the material. But as I said in class last week, learning does not best happen merely by listening to an “expert” and writing down notes. Doing something with the material yourself, whether answering questions, discussing with others, or some other activity, is important for learning. Here’s an article about a recent study about the value of “active learning”. Here’s a list of several studies supporting active learning. There are some studies that suggest that people can only pay attention to a lecture for a short amount of time, and it needs to be broken up by activities (see, e.g., this article). When I stop class to ask for comments or questions from the large group, that is also a way to break up the lecture. And some students wanted more people to participate during those times. I try hard to create a comfortable, safe atmosphere in class so that people feel okay doing so; but I realize that some still aren’t willing. So that’s why I do smaller group discussions during the M,W class too! And because twice as many people appreciated the discussions as didn’t, that also adds more support for me to continue doing this in class. To benefit from the discussions, though, you have to actually participate. One person giving feedback said they didn’t find the discussions in the M,W class helpful, but that could be because they weren’t participating. If you are sitting doing something else during those periods, it’s definitely not going to be useful to you. A few students said they liked using Learning Catalytics, with one saying it should be used more frequently. One said that it encouraged them to keep up with the readings and the class generally (which is certainly part of why I do it!). I said on the syllabus it wouldn’t be used every M,W class, and probably about once a week. But it could be used twice in some weeks! There was one student who thought the lectures sometimes went too slow, focusing for too long on one point, and one student who thought they lectures sometimes went too fast and I should slow down. Since there is no consensus on this, I will try to think about when I could speed up and when I might be speaking too quickly or rushing, and try to act accordingly rather than having a blanket change to what I’m doing. One student wanted more detail on the slides because it’s hard to write down from when I’m speaking. There is a reason why I don’t put more detail on the slides: you can’t listen and write down at the same time, and there is research that shows that if you just write things down verbatim from slides you don’t learn as much as if you have to think and put it in your own words. Plus, if I put everything on the slides then that reduces some of the motivation for coming to class. In student evaluations one year I had a student suggest putting less on the slides for this reason! A few students said they were distracted when others are going on social media or doing other things on their computers, unrelated to the class. 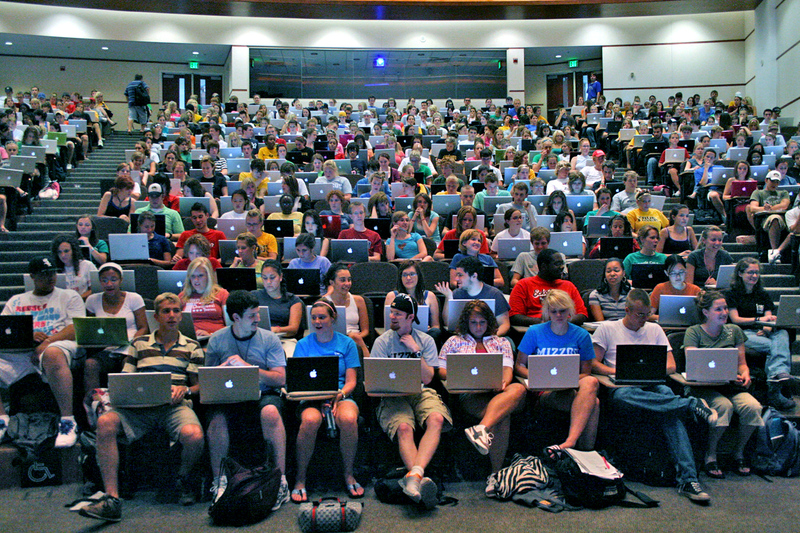 If you cannot stop yourself from doing things on your computer unrelated to the class, please SIT TOWARDS THE BACK so your screen is distracting to fewer people. I team-teach a course and attend the lectures by the other professors, and frequently get distracted by students’ screens when they are doing other things. This is a serious problem for those who want to pay attention! Doing other things during class breaks the collaborative guidelines we came up with, and is not only correlated with doing worse in that class, but also with those around you doing worse. See this page for research on these issues (scroll down below the collaborative guidelines). It is also distracting when people get up to leave in the middle of class or before class is finished. So if you’re going to get up to leave, also sit towards the back. A few students wanted more guidance for writing essays. I have written a 2-page guide to writing essays, and provided a marking rubric with things we look for when marking, on this page. The page also has links to other philosophers’ writing suggestions that I agree with. If you want more depth, here is a 5-page set of guidelines I wrote for a writing-intensive course I teach, Arts One. I have changed it slightly so that it fits this course. I’m also putting it on the “writing help” page linked above. In addition, the TA’s and I will write up a list of common suggestions for paper number 2, based on what they saw for paper number 1. We’ll send that to you as soon as it’s ready, and also post it here on the site! One student wanted to hear more about the bigger picture of what s/he should be getting from the course. What value can one get from what we’re learning and doing? How can it be applied to other courses and one’s life? I have designed this course to try to address that question, but I need to do a better job emphasizing it! One thing I’ve done is to show how the readings are relating to the bigger picture of the course, which is about what the “examined life” is and why it matters: is the unexamined life not worth living, as Socrates says? Another way to think about this is: what is philosophy and why is it valuable? The parts of the course are designed to show the different reasons why philosophical activity might be useful, for oneself (cultivating a happy life, as per Epicurus) and for others (how do we decide what to do morally? (Mill), what should we do to help those in need? (Singer, Nussbaum). I am also trying to cultivate skills you can use in other courses: learning how to outline arguments from readings in order to question and criticize them is something you can use in the rest of your life to clarify positions and see if they have good support for them. Learning how to write a clear argument is valuable not just in other courses, but you might need to do that in other aspects of your life such as in a job (granted, not in an academic essay exactly). I will try to think more about how I can emphasize the bigger picture! Posted in In the classroom, Lectures & discussion, Teaching and tagged student feedback on March 11, 2017 by Christina Hendricks. I participated in a #digped Twitter chat today (run by Hybrid Pedagogy), about class policies on use of electronic devices during class. As always, this chat was very helpful for pushing me to be honest with myself, my motivations, and my desires, as well as to consider new alternatives. I don’t have a policy against the use of electronic devices in class. I feel it would be hypocritical of me to do so because I rely so heavily on them myself during meetings and conferences–I take all notes electronically, and I frequently engage in Tweeting during conferences to promote interesting ideas or facts I’m learning and let others know what’s happening at that session in case they couldn’t make it. But I do get annoyed, and mostly sad, when I spend SO MUCH TIME preparing for courses (those of you who are teachers know how much time that is) and then feel like all that work is going to very little if many students aren’t paying attention. The #digped Tweet chat helped remind me that there are different ways of paying attention, and even when you think someone is not engaged, they may very well be engaged in a way that you don’t recognize as such. Plus, people need to be human beings, after all, and have breaks where they just zone out for a little bit and then come back. And I need to get over it when I think there is too much non-engagement (because what I think is non-engagement may not actually be such). This is a lesson I have to keep reminding myself. But on another note; there was a good deal of discussion about having the class guidelines be set collaboratively, with the students. I have 150 students in my Introduction to Philosophy course. I thought such a thing would be impossible. But in a separate discussion on Twitter yesterday, some colleagues suggested breaking students up into groups and having the groups write on a collaborative doc like in Google docs. I already had a collaborative doc on suggestions for respectful discussions, so I turned that one into a document about other guidelines for the class too. Click here for the doc; there is an embedded version below if you just want to look at it on this blog post. 1. Are these good questions to ask? Are the questions phrased well? Posted in In the classroom, Teaching and tagged collaborative guidelines, devices in class, PHIL 102 on September 4, 2015 by Christina Hendricks. As noted in an earlier post, I’m participating in mostly online course about teaching in a “blended” learning environment (partly online, partly face to face). The course is entirely housed within a closed environment on Blackboard Connect, unfortunately, but I’m posting some of my own contributions here so I can have them easily accessible even after the course ends. During this first week of the course, one of the things we were asked to do was to think about active learning strategies and complete an activity, for which the instructions can be found below in blue. My own answer follows the instructions. After completing this activity we were asked to think about how we might integrate technology into the activity. Since the use of a wiki is already there, I’m not sure I have anything to add to what I’ve already said in the first part of the activity. To get started, identify a current practice in your course that you would like to make more active. Drawing from resources presented above as a reference, explore the wide range of active learning strategies. Identify one of these strategies you’d like to try for your class. Plan and develop at least one active learning activity that you can integrate or scaffold (Bilash, 2009) into your course or module. In some of my philosophy courses, I ask students to do “argument outlines,” where they have a passage of text and they need to provide an outline of the premises and conclusion. We practice this in class with me first providing my outlines for arguments, and then they can practice in groups, and then they have to do one or two on their own on a quiz or exam. I would like to expand this activity so that they learn even more from their peers and get even more practice before doing it on an quiz by themselves. The following gives a chance for students to see more possible ways of outlining arguments, and to discuss amongst themselves which they think is best. It can also help them to see that there may be multiple ways of doing so that are all valid. I’ll ask everyone to read a short passage of assigned text, then come up with their own, individual outlines of it. Then, in a small group, they should share their outlines and decide, as a group, on an outline that they think is a good one. Hopefully they will get ideas from each other as to what might work and what isn’t the best way to go about outlining the premises and conclusion. Then, I’ll have a wiki page for each group on the UBC wiki, where they’ll type in their outline (one person in each group will need to have a laptop or tablet). There is a way (though I’m not sure yet how to do it, I’ve seen it done!) to put all the groups’ individual answers into one page after the groups have finished typing in their answers. I’ll have to figure out how to do that. Finally, in the last step, each group will take a look at the other outlines on the now-collated page, and decide which of those (including their own) they think is best. I’ll use something like “poll everywhere” to have each group to vote on which one they think is best, and see what the result is. We can then have a discussion about results. Added July 14, 2014: Actually, I think it would be better if they vote on which outlines they think work, rather than which is best. This can cut down on concerns about students feeling bad that theirs isn’t voted “best,” and also drive home the idea that there may be more than one way to do an outline that works. Of course, outlining an argument is only the first step; we also need to learn how to criticize arguments well. But that is an assignment for another day! Learning to identify, analyze, and criticize arguments is one of the basic skills we teach in philosophy courses. It is something that students can use in other courses and in their everyday lives. They won’t need to sit down and outline arguments as formally as we ask them to do, but to be able to identify what is being argued for and how, and then to be able to isolate particular premises and determine which are weak and which are strong, are skills that can be quite useful in the future. They are also some of the skills I ask students to practice and hone in my courses. 1. Read the following passage [give specifics on what to read] and write down what you think the conclusion of the argument is, as well as the premises (reasons) given to support it. This part of the activity is to be done on your own. You can write this down on a piece of paper or a computer or mobile device. You’ll have just five minutes to do this part of the activity, but don’t worry; you’ll be coming up with a group outline next, so it’s okay if you don’t finish your individual one. You will need to turn in your individual outline, but I’ll just be looking at it to see that you tried to do it, not marking how good it is. 2. In your small group [determined beforehand, making sure that at least one person in each group has a laptop or tablet], share your outlines amongst yourselves and discuss differences. Take fifteen minutes maximum to come up with a group outline of the argument, one that most or all of you agree with. It’s okay if not everyone agrees; know that there may be more than one valid way to outline any single argument, so there may be legitimate differences without someone being “wrong.” It’s best if most of the group agrees, however. 3. Type your group’s outline on the group page on the UBC wiki [URL will be given in advance]. 4. After all the groups have finished typing their outlines in, go to [give URL for collated page] to see all the groups’ outlines. I will also show as many of these on the screen at the front of the room as I can, but the space there is limited so it’s best if you can all look on someone’s screen to see them all. As a group, choose which of the outlines you think is best (it may be your own groups’ outline, or it may be that of another). You’ll have ten minutes to do so. July 14 addition: [Instead of voting on which is best, do the following:] As a group, choose outlines that you think offer a good analysis of the argument noting that there may be several different ones that work. So you may choose several outlines. 5. Using poll everywhere, I’ll ask each group to vote on the outline they think is best. One vote per group. Then we’ll discuss the results together as a class. July 14 addition: [Instead of the above, use this:] Using poll everywhere, each group should cast a vote for the outlines they think work (as many as the group thinks are good, not just one only). Then we’ll discuss the results together as a class. This activity counts as part of your participation mark for the course. I’ll be collecting the individual outlines you are going to do at the beginning of the activity, but just to see that you were there and participating. They don’t have to be finished because you don’t have a lot of time for that part of the activity, but you do need to have started and have something that matches the passage at least somewhat closely. If you wrote it on paper, submit it to me at the end of the class. If you typed it on your computer or tablet, submit it on the course website before midnight on the same class day as you did it. You will get either a plus for full marks, a minus for half marks, or a zero for not completing the activity at all. One potential problem I see already in what I’ve written above is with grading. At first I thought I’d just do this without any grading at all, but I realized that some students just won’t participate if it isn’t somehow monitored. So I decided to have them submit their individual outlines, and just give them a plus or minus or zero. Most everyone would get a plus unless they just didn’t try at all or weren’t there or were there but didn’t submit anything (zero). This, of course, only means they need to do the individual portion of the activity. They could then just do other things on their computers during the group portion if I don’t somehow monitor that. If I knew everyone’s names I could walk around the room and see who is participating in the group discussions and who is not, and mark accordingly. I have a few small classes in which I could do that, but many of my classes are nearly 100 students or more, and I don’t know everyone’s name. I could potentially have each group give each other marks, but that seems a bit of work when this is just a one-off class activity for which the groups themselves aren’t getting marks. I could give the group a mark for their outline and then ask each group member to mark the other group members. I’ll have to think about that option. it requires more work on my part (marking the group outlines as well as the individual outlines), and all that adds up when you have so many students! Another possible concern is that students might feel ashamed or embarrassed in front of their peers if they have to share their individual outlines and then the group comes up with one they mostly agree with; perhaps one or two students will feel that their work just isn’t up to par after this process, and they will be unhappy having shared it with others. Maybe emphasizing that there could be more than one way to correctly outline an argument could help, so those students might think their outlines could still be acceptable. I wonder if coaching the students on how to handle differences constructively might help? And if there isn’t a grade attached to the quality of the outline, just that people tried, this may help too–at least they don’t feel like they are getting a low mark in front of their peers. That’s a reason for maybe NOT grading the group outlines for quality; those groups who don’t receive many votes in the last part of the activity wouldn’t then have to feel that they are going to get low marks and everyone else can see that (which may not be true; popularity doesn’t mean correctness, but they might feel that way anyway). Overall, emphasizing that this is just practice and that mistakes are expected at this point might help as well. Posted in Blended/Flexible Learning, In the classroom and tagged Introduction to Philosophy, moral theory, PHIL 102, PHIL 230, T-BLE on July 12, 2014 by Christina Hendricks. In a recent post I explained that I just haven’t been very into digital storytelling, the second topic in etmooc. While many of the other participants have been busy creating animated gifs, 5 card stories, photo stories and more, I just wasn’t engaged enough to try to do much myself. But then something happened. Well, Cogdog (Alan Levine) happened. He gave a presentation on digital storytelling for etmooc, which I was able to join live. I’m not sure what was so inspiring about it, really–he introduced some tools, talked about how to write stories, asked some of the participants to play pechaflickr during the session. But somehow, partway through, I started getting excited. Probably it was Cogdog’s enthusiasm. He just is so into storytelling, and digital storytelling, that I thought, well, there must be something to this. His excitement was infectious. I caught it. The part of the presentation that really got me, though, was when he talked about how professional writing could be more like storytelling, that we could provide information, but do it in a more engaging way. He cited a book by Randy Olson called Don’t be Such a Scientist, which discusses the need for scientists to reach a broader audience and the power of storytelling to help do so. Olson was a professor at a university and then moved into filmmaking, and argues that scientists could learn a lot from the world of storytellers, in order to make what they do more accessible. And it hit me that this could be a great way to try to make my class lectures, the presentations I do for classes more engaging. I already try to ensure I don’t do too much lecturing and also have a good deal of activities for students to engage in during class time, discussions, working together in groups, etc. But why not find a way to make the lectures themselves more like stories? This is challenging, but it’s a challenge I’m suddenly wanting to take on. I just needed to find something that I felt passionate about, and getting students as excited as I am about philosophy is that something. Why not start small, by trying to incorporate some of the aspects of good storytelling practice in some lectures (it will take awhile to change many or all of them!). Why not, for example, start with a hook, something that draws people in, present an obstacle, resolve it, and then set up for a new story? (As discussed here, where storytelling meets math.) This could be done fairly easily without requiring too much in the way of time or learning new technological tools. Somehow I also got excited about the digital part of digital storytelling. I mean, I started to want to spend time with some of the tools. I started coming up with ideas for stories–like telling the story of a recent trip to New Zealand (some of the photos are posted on flickr, though the ones with people are private), or the story behind the name of this blog–and I was motivated to look around Cogdog’s 50+ ways to tell a digital story site to find tools that would work. My previous reluctance was due to numerous reasons, but partly because I didn’t want to put a lot of time into learning a new tool and creating something with it, only to discover that in a couple years’ time the tool would disappear. It’s hard to know which of these applications will stick around and which will die off. It seemed a waste of time. But then in his presentation Cogdog pointed out: sure, some of the tools will disappear, but you will still have all your source photos, video, text, transcripts, etc., and it’s not that hard to create the story again in something new. Good point. I’m still worried about making things for my son that will still be viewable 20 or 30 years down the road, so I’m making a photo book that will be printed; that way, technology obsolescence won’t destroy it (though dirt, water, and forgetting it in a box might). 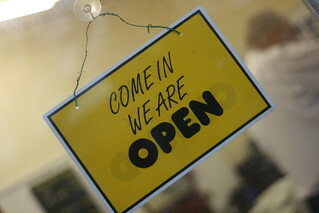 So I got up this morning and re-recorded my “true story of open sharing” for Cogdog’s collection. I tried to start with something that was a little more engaging … “I got a comment on my blog.” Okay, that’s not very exciting in itself, but it could make you think about what sort of comment on my blog could lead me to want to tell a story. It might get people wondering. The rest of the story is rather like it was before, but at least it’s a start. And I played around with iMovie (an application that comes with Mac computers) to add in a couple of titles, at the beginning and end, and put in some transitions from the titles to the video. I spent a good deal of time trying to lessen the background noise–an airplane, and my husband trying to get the pilot light on the gas fireplace lit. (I was originally going to film this in front of our fireplace, with the gas flames going, but it’s summer here in Australia and we turned off the pilot light. Turned out there was a trick to getting it back on and it took awhile to figure out! So I just filmed outside instead). I couldn’t really get the background noise gone completely without making my voice sound very, very strange. But it is better than it was. Then, I put the video into Mozilla Popcorn maker, because I wanted to include some relevant links (e.g., to my home page, to my blog). Here’s the result. Okay, so it took me a couple hours longer than I thought it would, but now I have the hang of Popcorn Maker. And special thanks to Glenn Hervieux (@SISQITMAN), who came to my aid on Twitter when I ran into a problem with it! Posted in Edtech, etmooc, Lectures & discussion and tagged digital storytelling on February 13, 2013 by Christina Hendricks. Most of us know very well the importance of space in the classroom–how the room is set up can really change the dynamics of a class. For example, in a discussion course, I try to set up the room in as much of a circle as possible (which, given the configuration of some rooms, is sometimes impossible). Once I had a seminar-style class in a room where we simply could not put the tables and chairs into a circle, and had to leave them in rows (because there wasn’t enough room to put them in a circle). That was the worst term I’ve ever had for discussion. A colleague of mine in the Arts One Program was even more innovative in her use of space than I’ve ever thought of being myself. I have had the chance to view the classes of some of my colleagues in Arts One over the past few years. I wish I had more such chances to see others teach, since I always learn from what others are doing in their classes. Arts One has two, 75-80 minute seminar-style discussion classes per week, with a maximum of 20 students, so most of the rooms we have allow for circular (actually rectangular) seating. There are tables arranged in a circle, with a big space in the middle of them. That works pretty well, since everyone can see everyone else. Still, the professor usually sits at one of the “heads” of the table, on one of the shorter ends (we don’t have to do this, of course, but I’ve often seen it done). Subtly, then, we are still making ourselves the focal point by making sure most students can see us well (often students avoid sitting right next to the prof, and sit on the longer sides of the table instead). This sort of setup is good for having books, paper and computers (if they’re allowed) out on the desk while engaging in discussion, but the tables with the big space in the middle cuts us off from one another in a sense, providing a pretty big distance from one another. Posted in In the classroom, Lectures & discussion and tagged Arts One, class discussion, student presentations on January 7, 2013 by Christina Hendricks.